Silbermann, 1, 235; abst. British Journal of Photography, 1907, 54, Col. Phot. Supp. 1, 80; J. S. C. I. 1903, 22, 923; Handbuch, 1917,4, II, 195; Phot. News, 1906, 50, 1040; Belg.P. 150,329, 1900; Phot. Coul. 1908, 3, 124. “R. Krayn’s patent50 is for the production of “pigment foils,” which were celluloid of from 0.05 to 0.25 mm. thickness. This was given a preliminary coating of rubber, wax, or rubber and collodion, or wax and collodion. Colloids soluble in cold water, such as gum arabic, starch, dextrin or the like might be used instead of gelatin. The Aktien-Gesellschaft für Anilin-Fabrikation51 patented the printing of carbon tissue on celluloid through the back, then hardening after development with formaldehyde and transferring to paper, and soaking the print in a solution that would soften the celluloid without dissolving it, such liquids being ethyl and methyl alcohol, benzol, etc., and the celluloid could then be stripped. 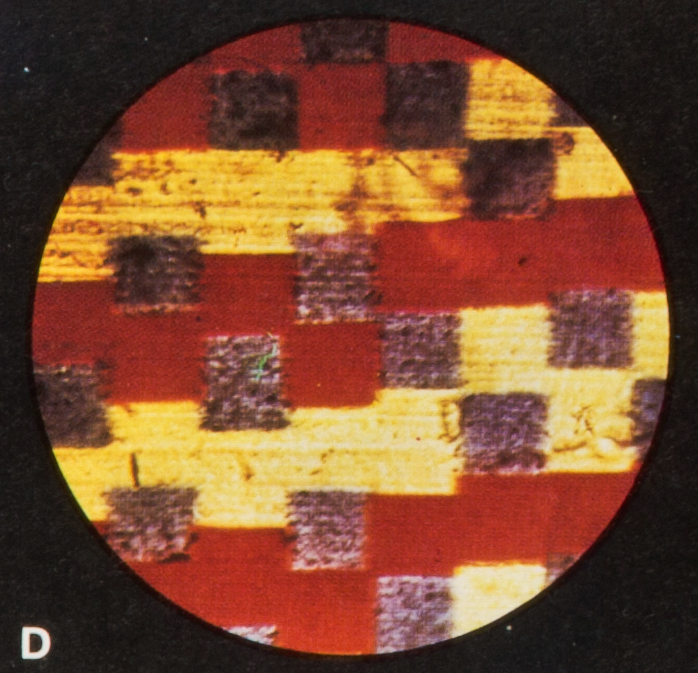 The same inventors later52 patented the manufacture of a special celluloid for carbon work, and claimed thus to obtain an easily strippable film. This was attained by the addition of castor oil, nitrobenzol, naphthalin, rubber in benzol, anilin, wax, resins or hydrocarbons of high boiling point. 50E.P. 13,093, 1902; D.R.P. 152,797, 1901; Silbermann, 1, 235; abst. Brit. J. Phot. 1907, 54, Col. Phot. Supp. 1, 80; J. S. C. I. 1903, 22, 923; Handbuch, 1917, 4, II, 195; Phot. News, 1906, 50, 1040; Belg.P. 150,329, 1900; Phot. Coul. 1908, 3, 124. Similar films were introduced by the Rotary Phot. Co., London. Cf. E. J. Wall, Phot. J. 1906, 46, 144; Brit. J. Phot. 1906, 53, 195; 1907, 54, Col. Phot. Supp. 1, 9; E. Grills, ibid. 17. Also by the Neue Phot. Gesellsch., Berlin. H. O. Klein, Brit. J. Phot. 1905, 52, 768; Phot. Korr. 1905, 42, 518, 568. A. C. Braham, Phot. J. 1906, 46, 178; Brit. J. Phot. 1906, 53, 106, 566. R. Namias, VI Congress Internat. Chim. Applic. 1906, 6, 36; abst. Camera Craft, 1907, 14, 110; Brit. J. Phot. 1906, 53, 469; Phot. Kunst. 1906, 4, 345. 51D.R.P. 154,539, 1903; Silbermann, 1, 236; F.P. 339,654. 52E.P . 925, 1904; D.R.P . 160,665, 1903; Silbermann, 1, 237. In 1906 Robert Krayn (1865-1915) of Berlin patented a line screen whose method of manufacture departed completely from that of Joly’s and McDonough’s products.18 To obtain his screens, he stacked thin sheets of celluloid dyed red, green, and blue one on top of the other so as to get a thick pile of alternately colored sheets, which he then cemented, compressed, and sliced into sections of thin colored lines (Fig. 2.14).19 The Krayn Line Screen was introduced in Germany around 1909 by the Deutsche Raster-Gesellschaft of Berlin, but the product did not meet commercial success and rapidly became obsolete probably because of its coarse screen (Valenta 1911). 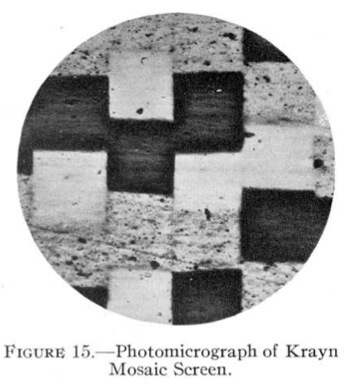 Krayn tried to improve his product with a square mosaic pattern obtained by stacking the celluloid sections of lines described above, cementing them in a block, and cutting them into sections across the lines to obtain colored squares (Fig. 2.15), the side of which was equal to the thickness of the original celluloid sheets (Mees and Pledge 1910).20 That product remained experimental and was never produced commercially. Krayn eventually abandoned the idea of using sections of materials to produce his screens and investigated already-developed printing methods. In 1910 the Neue Photographische Gesellschaft (N.P.G.) of Berlin introduced Krayn’s new product, Deutsche Farben-Film (New Krayn Process or Krayn Color Film).21 It was the first additive screen product on plastic film placed on the market. To make the screen, celluloid was coated with gelatin and impressed with a series of black greasy ink lines; the interstices between the lines were dyed red and mordanted.22 The fatty ink was removed, and a second impression of fatty ink lines was given at a 45-degree angle from the first one. A second dyeing and mordanting followed, this time in blue. After removal of the greasy ink, the film was dyed green and mordanted a final time, then coated with a waterproof varnish to isolate the colored screen from the light-sensitive emulsion. 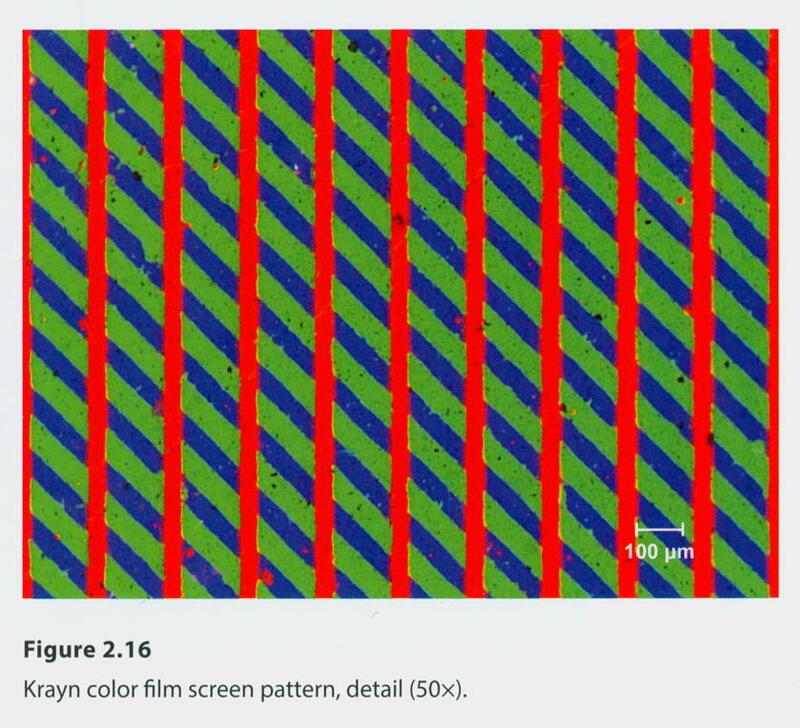 The screens pattern was composed of continuous red lines over alternated green and blue bands at 45-degree angles to the red lines (Fig. 2.16). Krayn Color Film was produced with two different emulsions. One was panchromatic, for use in the camera, and was processed as a negative instead of being reversed into a positive like all other combined systems. The other, called positive film, had a nonpanchromatic emulsion on which the negative was printed by contact (Blackburn 1911). 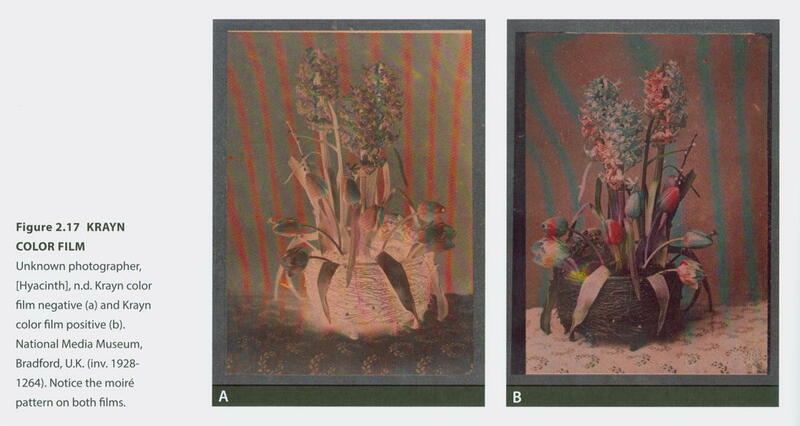 The transparencies were usually bound between glass for protection and to allow projection. 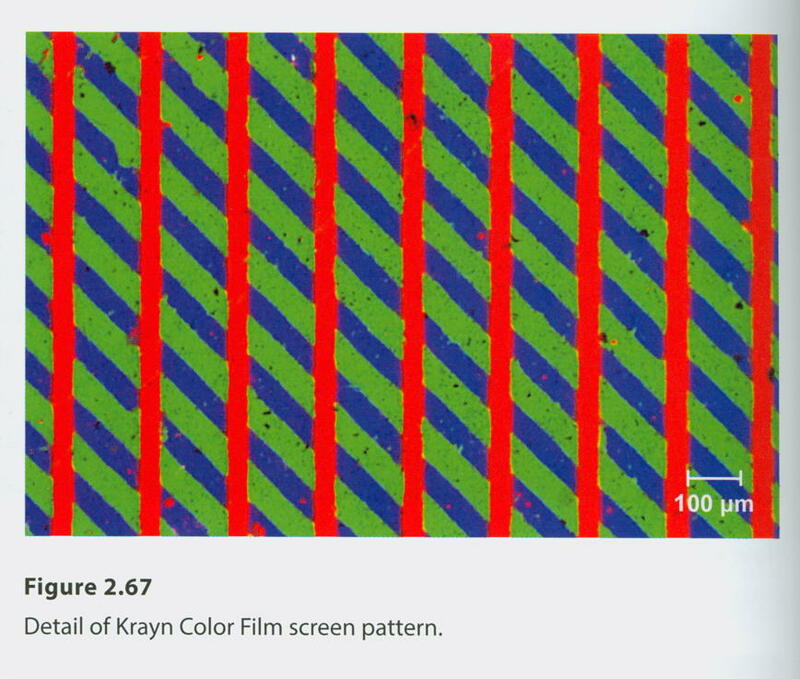 Krayn Color Films found only modest commercial success (Coe 1978: 68), probably because it was difficult to avoid the moiré effects that resulted from printing one screen film onto another (Fig. 2.17).23 Production of the film most likely ceased in 1911 when Deutsche Raster GmbH, a subsidiary company specially created by N.P.G. in 1909 for marketing the color screen film, was liquidated (Wentzel 1960). 18 English Patent 1,938 (1906). 19 Celluloid: A semisynthetic plastic that was patented in 1869 by the brothers John Wesley Hyatt (1837-1920) and Isaiah Smith Hyatt (1829-1885). It is composed of cellulose nitrate and camphor and was used in a variety of commercial applications until it became obsolete in the 1940s with the introduction of petroleum-derived plastics. 20 English Patent 2,213 (1908). 21 U.S. Patent 1,055,189 (1913). N.P.G. was founded in 1894 by Arthur Schwarz (b. 1862) and rapidly became well known for its photographic postcards. The firm occupied a leading position in the German photographic industry for a couple of decades. After World War I, in 1921, the company merged with Mimosa A.G. of Dresden (Wentzel 1960). 22 Mordanting: Consists of fixing a dyestuff in or on a material by combining a substance called a mordant with a dye to form an insoluble compound. 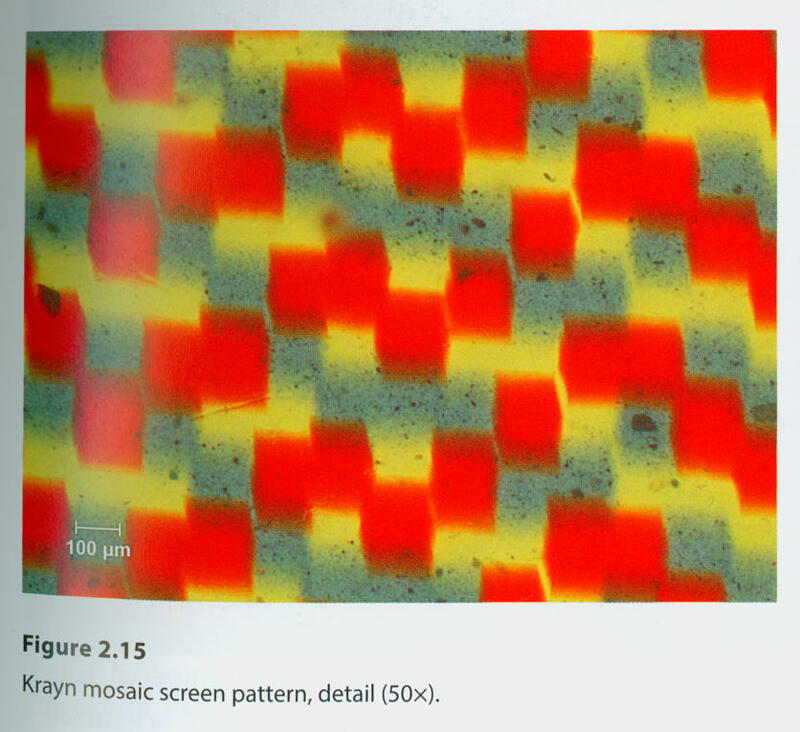 23 Moiré effect: An interference pattern created when two similar repetitive grids are placed on top of each other. Blackburn, H. E. 1911. “The Krayn New Colour-Screen Film Process.” British Journal of Photography Monthly Supplement on Colour Photography (Dec. 1): 67–68. Mees, C. E. Kenneth, and J. H. Pledge. 1910. 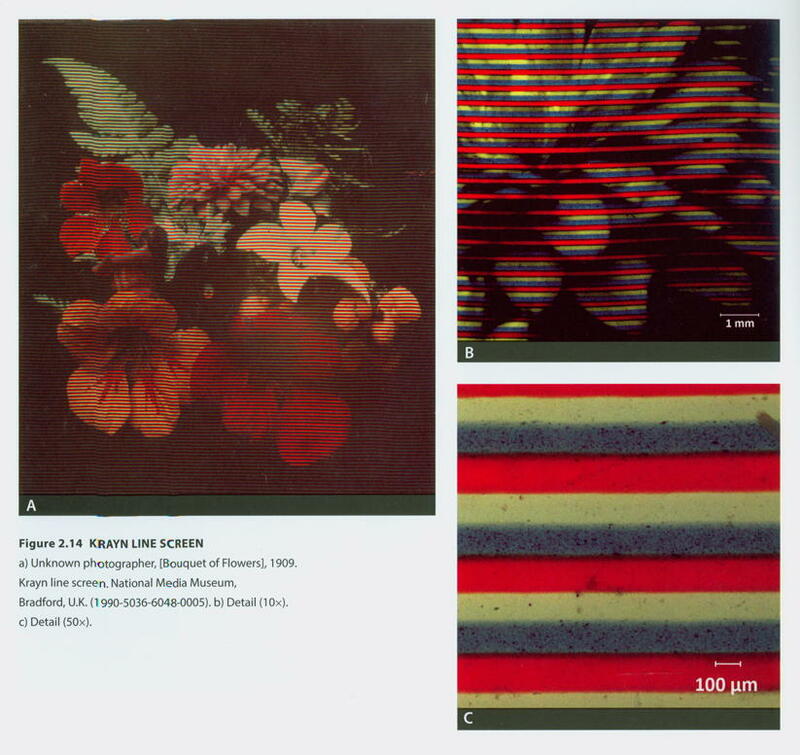 “On Some Experimental Method Employed in the Examination of Screen plates.” Photographic Journal 50 (May): 197–221. Valenta, E. 1911. “Herr E. Valenta on the New Krayn Screen-Plate.” British Journal of Photography Monthly Supplement on Colour Photography (Apr. 7): 30–31. 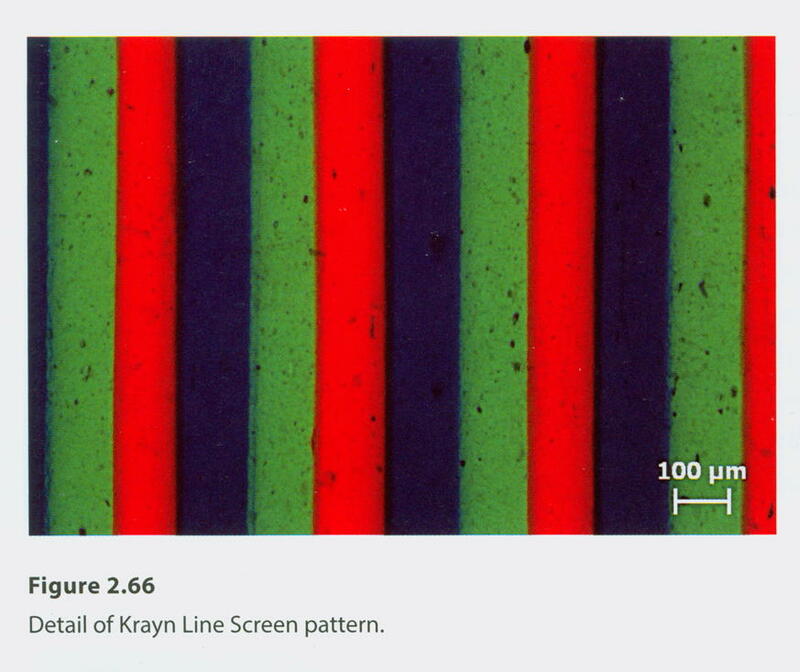 “Krayn Line Screen (1909-1911): sequence of red, blue, and green lines made from sections of dyed films cemented together (Fig. 2.66). In specular light, parallel raised lines can be seen on both sides of the film. Lines are large enough (approximately 0.14 mm wide) to be seen with the naked eye or a 5X loupe. Lines run parallel to the length of the plate.